I came across the Kioptrix Virtual Machines (VM) on VulnHub today and find them pretty interesting. Hence, I attempted some penetration tests on the Kioptrix: Level 1 (#1) and managed to get root (the objective of the game). A quick background on the VMs found on VulnHub – they are basically VMs which are vulnerable by design – specially created for security researchers or any security enthusiasts (like myself) to perform security testing on them, or to try out known exploits as a form of Proof of Concept (POC). I found 2 methods of getting root, one requires some modification to a readily obtained exploit code, while the other one uses the Metasploit tool to automatically get root using a generated payload. Let’s get started. Before we go into either methods, we need to perform some general reconnaissance to understand what services are there. Check out CVE-2003-0201,Samba ‘call_trans2open’ Remote Buffer Overflow vulnerability. Now, we can simply launch Metasploit to do the job for you. + OpenSSL/0.9.6b appears to be outdated (current is at least 1.0.1j). OpenSSL 1.0.0o and 0.9.8zc are also current. 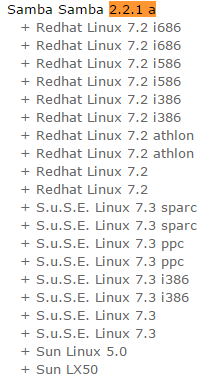 + Apache/1.3.20 appears to be outdated (current is at least Apache/2.4.12). Apache 2.0.65 (final release) and 2.2.29 are also current. + OSVDB-838: Apache/1.3.20 - Apache 1.x up 1.2.34 are vulnerable to a remote DoS and possible code execution. CAN-2002-0392. + OSVDB-4552: Apache/1.3.20 - Apache 1.3 below 1.3.27 are vulnerable to a local buffer overflow which allows attackers to kill any process on the system. CAN-2002-0839. + OSVDB-2733: Apache/1.3.20 - Apache 1.3 below 1.3.29 are vulnerable to overflows in mod_rewrite and mod_cgi. CAN-2003-0542. + mod_ssl/2.8.4 - mod_ssl 2.8.7 and lower are vulnerable to a remote buffer overflow which may allow a remote shell. http://cve.mitre.org/cgi-bin/cvename.cgi?name=CVE-2002-0082, OSVDB-756. Here, we need to make some modification to the code before compiling it. you can do it using any text editor. i like to use VIM so I will be running the following command. From this part onwards, I need you to follow closely. I try to be as clear as possible – if you still got lost along the way, please feel free to leave a comment to clarify. Modify the ‘wget’ method in the exploit itself because the url does not exist anymore. we need to update it to become the new URL to download the file. Now we need to install the ssl-dev library into our server or else we will face difficulty compiling the code. Now, you are done with the mod_ssl exploit! Of course, we are only interested in the following 2 types which are designed for Red Hat Linux, using apache version 1.3.20. Trying out using the 0x6a option …. And it works. Congrats, you have root now. Either method should work. Level goal: A daemon is listening on port 30002 and will give you the password for bandit25 if given the password for bandit24 and a secret numeric 4-digit pincode. There is no way to retrieve the pincode except by going through all of the 10000 combinations, called brute-forcing. The script will iterate through each possible PIN to perform brute forcing in identifying the secret pincode of bandit25. The password to gain access to the next level is uNG9O58gUE7snukf3bvZ0rxhtnjzSGzG. Level goal: A program is running automatically at regular intervals from cron, the time-based job scheduler. 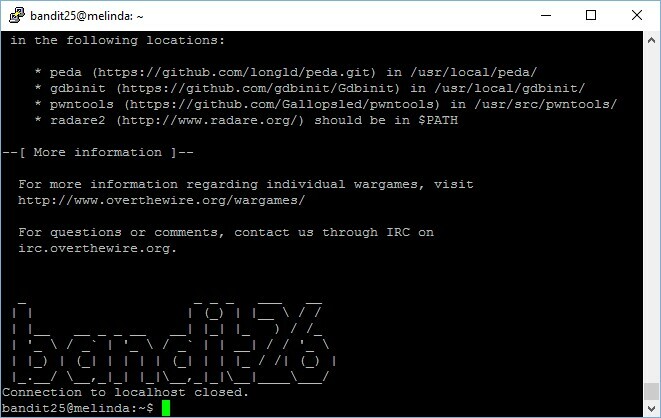 Look in /etc/cron.d/ for the configuration and see what command is being executed. NOTE: This level requires you to create your own first shell-script. This is a very big step and you should be proud of yourself when you beat this level! Important: remember to change the permission of your script before copying it to the /var/spool/bandit24 folder or it will not be run by the bandit24 account. It took me a few tries to notice it. The scripts in /var/spool/bandit24 will be run once and then purged away every minute. The password to gain access to the next level is UoMYTrfrBFHyQXmg6gzctqAwOmw1IohZ. 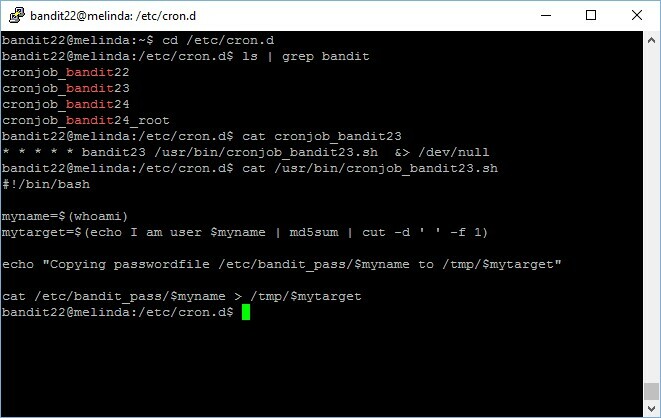 Like what we have done in the previous level, let’s navigate to the /etc/cron.d path and check the cronjob files. 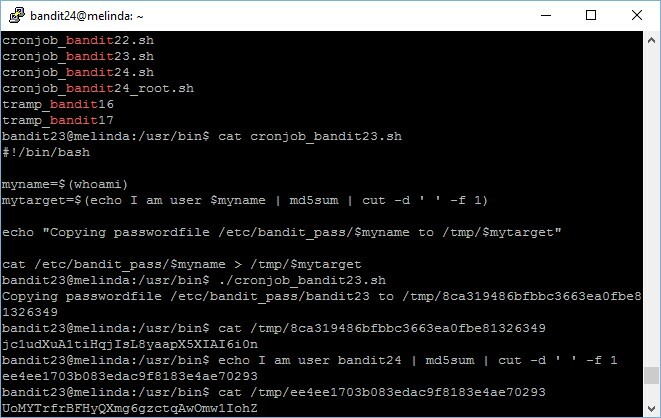 Notice that cronjob_bandit23 is will be running the /usr/bin/cronjob_bandit23.sh script? Let’s view its content. echo "Copying passwordfile /etc/bandit_pass/$myname to /tmp/$mytarget"
Yes, you have guessed correct. When this script is being run, it will write the currently logged-on user’s password into a file. 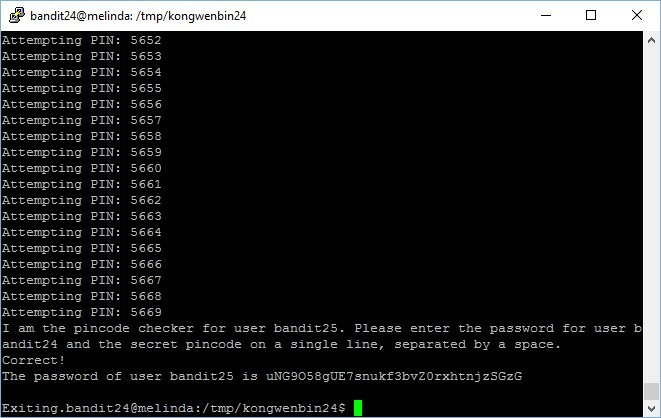 Since we need the password of bandit23, let’s manually run the hash and use its hash as the directory name. The password might be there, provided that someone with the bandit23 credentials has already ran this script (they probably have). The password to gain access to the next level is jc1udXuA1tiHqjIsL8yaapX5XIAI6i0n.